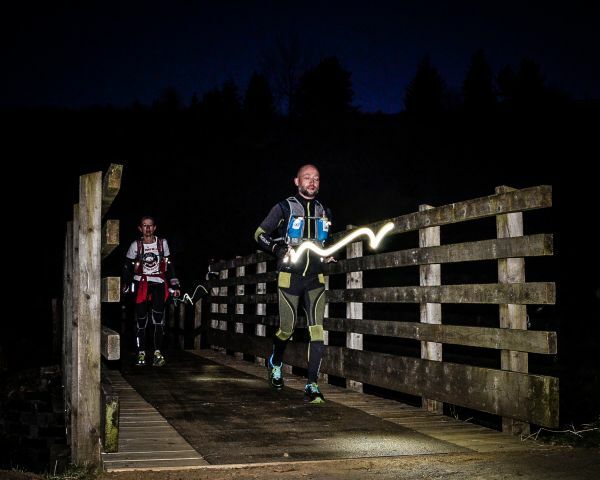 Northumberland’s famous dark skies put on a good show for runners at Kielder Water & Forest Park this weekend. More than 80 people turned up to take part in the first ever ‘Dark Skies Run’ on Saturday April 18, 2015. The race, which started during the daylight, saw entrants running through the sunset and cross the finish line under the stars of the darkest night skies in England. Race Director, Phill Turton said: “All our entrants had been speculating for weeks on social media as to what the weather would be like but the weather Gods were definitely smiling on us! One of the largest Dark Sky Parks in the world, Kielder was awarded gold tier Dark Sky Park status by the International Dark Skies association in December 2013, making it the perfect venue for the ultimate starlit running challenge. Organised by Trail Outlaws and supported by Northumbrian Water, the event followed the Lakeside Way trail around northern Europe’s largest man-made lake. For one racer, the Dark Skies Run was the finish of an incredible day that had started at midnight on Friday April 17. Sunderland Stroller, Malcolm Cox, ran an unofficial marathon distance around Lake Windermere, Cumbria, before cycling the 90 miles to the start line of Kielder’s Dark Skies Run. Not only did Malcolm finish his second long-distance run of the day, he won the Men’s over 50s category with a race time of 4 hours and 20 minutes. The overall winner of the Dark Skies Run and first in the Men’s over 40 category was Philip Hewitt who completed the race in 3 hours 50 minutes and 35 seconds. Claire Baharie, also a member of Sunderland Strollers, was the first female to cross the finishing line in 4 hours 12 minutes and 10 seconds.